24HR Collision Center has brought our professional auto body repair services and VIP customer care to Surrey, BC! Our Surrey auto body shop is located at 7815 132 Street and serves the communities of South Surrey, Burnaby, Langley, Richmond, Abbotsford, White Rock, Cloverdale, Fleetwood, Guilford, Newton, and Whalley. We chose to open our second auto body shop in Surrey because we saw a need for a quality-focused—and customer-focused—auto body shop in the area. There’s no doubt the residents of Surrey work hard and deserve the best in vehicle repair! If you’re looking for our Surrey body shop, we are the big red building on the eastern corner of 132 Street and 78 Avenue, near Scott Road in the Newton area of Surrey. We’re also close to Nordel Way, and, for students, we’re convenient to Kwantlen University. Surrey is a busy, growing city, and 24HR Collision Center looks forward to growing with it! 24HR Collision Center offers big city service—we’re talking nice courtesy vehicles and extended hours—in a family atmosphere. You’ll appreciate the friendly, helpful nature of our customer service associates. At the same time, our auto body technicians are Master collision specialists and OEM-certified, ensuring you get the best auto body repairs in the industry. Call Our Surrey Body Shop for ICBC insurance claims, auto paint, auto glass replacement, and much more! We Look Forward to Serving You, Surrey! If you live in Surrey, call or text 24HR Collision Center when you need auto body work. We look forward to providing you with professional, VIP service and earning your trust and recommendation. 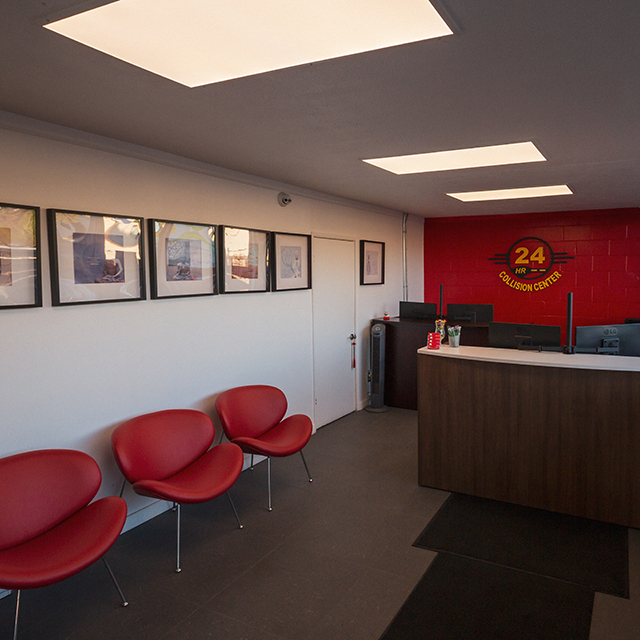 At 24HR Collision Center, we promise to work just as hard as you do, Surrey, with the goal of returning your vehicles to you quickly and in pre-accident condition.